Heat waves, mosquito outbreaks, landslides: 6 ways climate change is hitting the U.S. The National Climate Assessment describes how global warming is damaging the U.S. today — and where it could wreak the most havoc in the future. Heat waves that make Chicago feel like Las Vegas. Warming ocean temperatures that displace Maine's lobsters. A year-round spike in disease-carrying mosquitoes in Florida. These are just some of the ways climate change could play out across the country over the coming decades, according to the federal government's National Climate Assessment, released over Thanksgiving weekend. The last time the United States issued a version of this report, in 2014, critics said it would be stronger if it focused more on the impact of climate change on the local level. The new version of the report does just that — giving scores of accounts of how human-caused climate change is damaging the U.S. today and how it’s projected to wreak more havoc in cities, states and regions by the end of the century. If the world continues pumping out Earth-warming greenhouse gases at current levels, Chicago could see almost as many 100-degree days by the year 2100 as Las Vegas experienced, on average, from 1981 to 2010, the study predicts. Chicago hit 100 degrees Fahrenheit less than once a year on average between 1976 and 2005, the baseline period the study used for comparison. With no reduction in emissions of carbon dioxide and other greenhouse gases, the projected number of those very hot days would jump anywhere from 3 to 63 days per year by 2100, the study says. 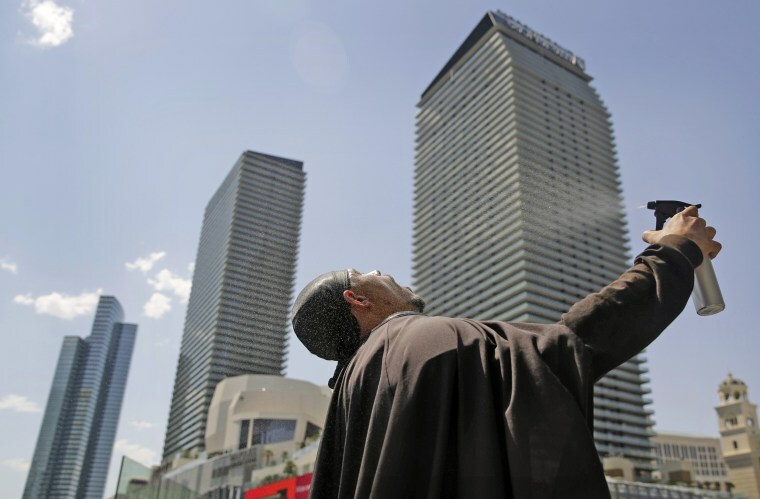 Las Vegas averaged 67 days with temperatures above 100 in the three decades ending in 2010, according to Jim Angel, state climatologist of Illinois, who helped draft the report. The report acknowledges that there is a broad range of potential outcomes and that the degree of uncertainty about temperatures “becomes larger further into the future.” But it predicts a distinct warming trend across the Midwest. A severe heat wave and drought that gripped the Midwest in 2012 has made the public more receptive to the idea that climate change is fueling severe weather, Angel said. Outsized rain downpours have destabilized coastal bluffs, triggering landslides and regularly shutting down parts of Amtrak’s busy Portland-to-Seattle train service. Extreme weather in the Pacific Northwest has included severe drought, large wildfires, heat waves and record blooms of harmful algae. But the regular disruptions along the busy Cascades rail corridor have gotten particular attention from commuters. A total of 240 breaks in service between 2009 and 2013 because of landslides amounted to more than a quarter of all landslide shutdowns for the past century. The Pacific Northwest is no stranger to rain, but the impacts of global warming have made precipitation in the region less predictable — with unusual dry periods followed by deluges, and attendant landslides, the report’s authors say. Climate change is expected to continue raising the risk of landslides in the future, the study says. “These are commuter lines that people use between Seattle or Bellingham [Washington] and Portland. It’s been hugely disruptive,” said Kris May, an environmental consultant and lead author of the report’s chapter on the Northwest. Wildfires in the West have burned twice as much acreage since 1985 as they would have without climate change. And the area burned in the Sierra Nevada mountains could triple in the last three decades of this century, if humanity does nothing to check greenhouse gases, the report says. The impact of severely dried brush and timber has been revealed in devastating terms in California in the last two years. The 2017 Thomas Fire burned more acres in Ventura and Santa Barbara counties than any fire in state history. And the recent Camp Fire killed more people, at least 88, and burned more residences, nearly 14,000, than any other California wildfire. The projection for potential fires in the Sierra Nevada mountains compares the period from 1961 to 1990 to 2071 to 2100. The tripling of burned acreage is a worst-case scenario. If the world manages to meet the anti-warming goals set in the 2015 Paris climate accord, the wildfire damage would increase only slightly from the past, the report says. The home grounds of lobster have shifted north and become more unpredictable, challenging fishermen to deliver one of New England’s most prized exports. Temperatures on the northeast Atlantic coast are now climbing about 1 degree Fahrenheit roughly every 16 years, and the spiny sea creatures have been more resilient in the cooler waters to the north. Lobster skippers in the seas south of Cape Cod brought in more than 2,000 metric tons of the catch at a peak in the 1990s, but caught few lobster in recent years. Off Maine, the catch has more than doubled over the same time period, before suffering a sharp decline last year. The concern in Maine is that continued warming could drive lobster out of the area, just as warmer water did in Massachusetts and Rhode Island, said Kathy Mills, a research scientist at the Gulf of Maine Research Institute and a report co-author. The prevalence of disease-carrying mosquitoes is expected to increase across Florida and much of the Southeast as temperatures warm. That could mean higher rates of dengue, Zika and other illnesses, according to the report, which does not give specific predicted figures. Heat and humidity projections are such that the transmission of the diseases could become year-round in southern Florida, the climate assessment says. “Summer increases in dengue cases are expected across every state in the Southeast,” it adds. The finding of particular susceptibility in the Southeast, with its warm and humid climate, follows an earlier report from the Centers for Disease Control and Prevention, which found that the number of cases of diseases from mosquito, tick and flea bites tripled in the U.S. from 2004 to 2016. While mosquito season in Florida typically began around May with the arrival of the rainy season, higher average temperatures mean a longer breeding season and more vulnerability for humans. Higher temperatures, longer periods of retreating sea ice and sea level rise have combined to create massive erosion along Alaska’s coastlines, particularly in the Arctic. In some places, including near Camden Bay, the shore has retreated by more than 100 feet per year, the report says. The result is that entire communities, mostly of indigenous people, have been forced to build protective barriers or relocate to higher ground. A 2009 report by the Government Accountability Office found that 31 Alaska communities, along the Arctic and other seas, faced an imminent threat from erosion. The village of Newtok on the Bering Sea recently received $15 million from Congress to help fund its relocation to a site it acquired in 2003 from the U.S. Fish and Wildlife Service. The village government hopes to begin the move by next year, though it hasn’t collected anything close to the estimated $100 million required to relocate the entire community of 354 people.